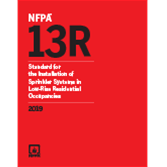 Install sprinkler systems in low-rise occupancies using updated requirements in the 2019 edition of NFPA 13R. Keep your knowledge up to code with NFPA 13, Standard for the Installation of Sprinkler Systems in Low-Rise Residential Occupancies, including comprehensive requirements governing system installation, including water supply and system acceptance. Installers and contractors need the 2019 edition of NFPA 13R to complete jobs correctly, work with the latest technologies, and reduce risks while maximizing efficiency. Interested in other editions of NFPA 13R? Use the drop down menu above to select the edition year you need. 5.2 Aboveground Piping and Equipment. 6.1 System Protection Area Limitations. 7.1 Design Criteria — Inside Dwelling Unit. 7.2 Design Criteria — Outside Dwelling Unit. 7.3 Design Criteria — Garages. 9.4 Connection from Waterworks System. 9.6 Connections to Waterworks Systems. 9.8 Penstocks, Flumes, Rivers, Lakes, or Reservoirs. 10.1 Approval of Sprinkler Systems. 11.1 Stock of Spare Sprinklers. 11.3 Inspection, Testing, and Maintenance. NFPA 13R helps you design and install life-saving sprinkler systems in multiple-family dwellings -- to safeguard people and property from fire. For effective and economical sprinkler system installation in multifamily occupancies -- such as apartment buildings and hotels -- buildings, designers, owners, and AHJs rely on NFPA 13R: Standard for the Installation of Sprinkler Systems in Low-Rise Residential Occupancies. This comprehensive Standard takes into consideration the greater occupant loads and increased risks associated with stacked dwelling and sleeping units in these types of dwellings. NFPA 13R's requirements cover design and installation, including water supply and system acceptance. Each subsequent edition of the Standard reflects new research, advanced equipment, and changes in the built environment. The 2016 edition of NFPA 13R: Standard for the Installation of Sprinkler Systems in Low-Rise Residential Occupancies adds clarification on the re-use of sprinklers, and uses new language concerning nonmetallic piping compatibility for consistency with NFPA 13. Reorganized and restructured sections address sprinkler protection outside of dwelling units to make requirements easier to apply. The 2013 edition of NFPA 13R: Standard for the Installation of Sprinkler Systems in Low-Rise Residential Occupancies introduces a new title along with major updates reflecting industry developments. Changes include a four-head calc that will help eliminate conflicts in determining sprinkler coverage for sloped and beam ceilings; revised coverage on dry type sprinkler heads; and new information on "shadow area" to help avoid ceiling fan blockage. This edition also clarifies the use of residential sprinklers outside of dwelling units. Another critical update addresses antifreeze use. The 2010 edition of NFPA 13R: Standard for the Installation of Sprinkler Systems in Residential Occupancies up to and Including Four Stories in Height improves referencing and usability, with separate chapters for system installation, discharge, plans and calculations, water supplies, acceptance testing, and care and maintenance. Helpful new annex material helps you determine when NFPA 13R is applicable and when it is not. The 2007 edition of NFPA 13R: Standard for the Installation of Sprinkler Systems in Residential Occupancies up to and Including Four Stories in Height adds sprinkler spacing and obstruction rules that address sloped ceilings, ceiling pockets, ceiling fans, and kitchen cabinets. In addition to clarified requirements for utilizing Quick Response Sprinklers, this edition adds requirements addressing architectural features within the dwelling unit. It also includes clarified closet requirements, including obstructions within the closet and protection of mechanical closets. The 2002 edition of NFPA 13R: Standard for the Installation of Sprinkler Systems in Residential Occupancies up to and Including Four Stories in Height introduces technical changes including new sprinkler discharge rules and new design requirements for garages. A new user-friendly format incorporates exceptions into requirements, to save users time throughout the design and installation process. The 1999 edition of NFPA 13R: Standard for the Installation of Sprinkler Systems in Residential Occupancies up to and Including Four Stories in Height provides essential requirements for the installation of life-saving sprinklers in multiple family residential occupancies. It includes provisions for water supplies system components, system flow rates, and sprinkler location and position.